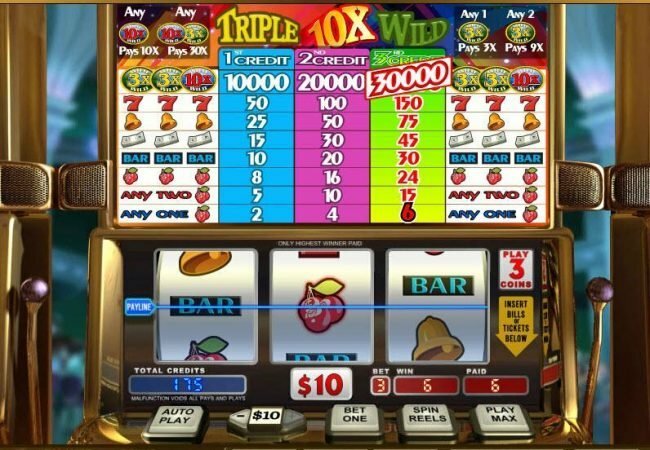 Triple 10x Wild Slots has not been reviewed yet, be the first to rate this slot. Triple 10x Wild is a 3 reel, single payline classic Slot from WGS Technology. This game sends players back in time to a classic era of Gambling where consistent payouts are relevant. 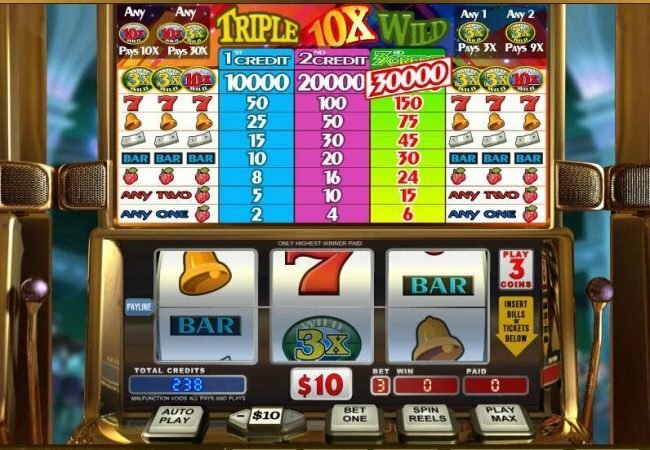 This game provides wilds, Bonus multipliers and a maximum payout of $30,000.00. As a classic slot, this game stands as one of the better on the market. This game looks as if you are playing a land based Slot Machine. You can see the lever to the right hand side as metal claps over the reels and payout information. The classic buttons seen on a land based slot machine sit beside the lever. Looking to the reels has sevens, bells, cash, bars, strawberries and multiplier icons all seen. The feeling of reminiscently is evident while playing this slot. Playing this game isn’t difficult. There are two options granted to the player with the first being to alter the denomination of each coin that’s about to be wagered. The value of these coins vary from $0.01 to $10.00. The next option is to determine if one, two or three coins will be played. When playing three coins at the maximum denomination, the $30.00 maximum bet becomes at play. The two features available in the slot are intertwined together as one. Anytime a 3x or 10x Wild icon is displayed in a winning line then that payout just awarded will be increased by the value of the multiplier. Landing on the $30,000.00 jackpot with a 10x multiplier active would increase the value of the maximum payout to $300,000.00. Conventional wilds are available in this slot due to the fact that there’s only one reel to be seen. Triple 10x Wild, even though it’s developed in a classic format doesn’t mean it isn’t fun to play. Due to the lack of reels & game features, payouts are far more consistent then on a modernly designed slot. The fact that this game is so affordable while offering such high payouts only furthers the enjoyment that this game has to offer. We recommend this game to those looking for a new classic slot to enjoy. Lincoln terms state that you must make a qualifying deposit between no deposit bonuses to be qualified to process a cash out. Be sure when you use a No Deposit Casino bonus code from Intertops casino as you know with Proprietary run Online Casinos, you have to post a qualifying deposit between no deposit Online Casino Bonuses. Be sure you do not use multiple no deposit bonuses back to back as your balance could be removed without making a deposit. Note that Australia, Canada, Denmark, Greece, India, Ireland, Israel, Lebanon, Poland, Romania and United Kingdom players are restricted at Liberty slots casino. Be sure you do not use multiple free promotions back to back at Liberty Slots as they may not pay you for not following the rules. Australia, Canada, Denmark, Greece, India, Ireland, Israel, Lebanon, Poland, Romania and United Kingdom locations are not able to play at Liberty slots casino. Be sure you do not use multiple no deposit bonuses back to back at Liberty Slots as your balance may be removed without making a deposit. Liberty slots casino is restricted in Australia, Canada, Denmark, Greece, India, Ireland, Israel, Lebanon, Poland, Romania and United Kingdom locations. Do not use multiple Free Casino Bonuses as they may not pay you for violating terms. Take care you do not use multiple no deposit casino bonuses as they may not pay you for not following the rules. Be sure when you use a No Deposit Casino bonus code from Red Stag Casino as with most WGS powered casinos, you must post a qualifying deposit if the last bonus was also a free one. Take care you do not use multiple free Bonuses back to back as they may not pay you for violating terms. Note that Australia, Canada, Denmark, Greece, India, Ireland, Israel, Lebanon, Poland, Romania and United Kingdom players are forbidden at Liberty Slots. Miami Club terms state that you have to make a deposit between multiple no deposit casino bonuses to be allowed to make a cash out. Be sure when you use a free Casino Bonus code from Miami Club casino as you know with WGS powered casinos, you are required to post a deposit if the last casino bonus was also a free one. Do not use more than one free Casino promotion back to back at Lincoln as your winnings may be removed without a deposit. Be sure when you use a free bonus code from Liberty Slots as with most WGS operated casinos, you have to post a deposit between Free Casino Bonuses. Australia, Canada, Denmark, Greece, India, Ireland, Israel, Lebanon, Poland, Romania and United Kingdom locations are forbidden at Liberty Slots. Do not use multiple Free Casino Bonuses at Lincoln as your winnings could be removed without a deposit. Do not use multiple no deposit promotions back to back at Liberty Slots as they may not pay you for violating the rules. Note that Australia, Canada, Denmark, Greece, India, Ireland, Israel, Lebanon, Poland, Romania and United Kingdom players are not able to play at Liberty slots casino. Be sure you do not use multiple free Casino promotions as they may not pay you for violating terms. Be sure when you use a no deposit bonus code from Red Stag Casino as with most WGS powered Online Casinos, you have to post a qualifying deposit between Free Casino Bonuses. Red Stag requires that you must make a qualifying deposit between free Bonuses to be allowed to make a withdraw. Be sure when you use a No Deposit Casino bonus code from Red Stag Casino as with most WGS run Online Casinos, you must post a deposit between free Online Casino Bonuses. Do not use more than one free promotion as your balance could be removed without a deposit. Red Stag requires that you have to make a qualifying deposit between no deposit bonuses to be allowed to make a withdraw. Be sure when you use a No Deposit Casino Bonus code from Intertops casino as you know with Proprietary operated casinos, you are required to post a qualifying deposit between no deposit casino promotions. Take care you do not use multiple free casino promotions at Liberty Slots as they may not pay you for not following terms and conditions. Note that Australia, Canada, Denmark, Greece, India, Ireland, Israel, Lebanon, Poland, Romania and United Kingdom players are restricted at Liberty Slots. Be sure when you use a No Deposit Casino Bonus code from Liberty Slots Casino as with most WGS powered casinos, you have to make a qualifying deposit between No Deposit Casino Bonuses. Liberty Slots is restricted in Australia, Canada, Denmark, Greece, India, Ireland, Israel, Lebanon, Poland, Romania and United Kingdom countries. Miami Club requires that you have to make a deposit between Free Casino Bonuses to be qualified to process a cash out. Be sure when you use a No Deposit Casino bonus code from Liberty slots casino as you know with WGS powered casinos, you are required to post a qualifying deposit if your last Casino Bonus was a free one. Australia, Canada, Denmark, Greece, India, Ireland, Israel, Lebanon, Poland, Romania and United Kingdom locations are restricted at Liberty Slots casino. Do not use multiple free Casino promotions at Red Stag as your balance may be removed without making a deposit. Be sure when you use a No Deposit Casino bonus code from Lincoln as you know with WGS operated Online Casinos, you must post a qualifying deposit between free Online Casino Bonuses. Do not use multiple free Bonuses at Red Stag as they may not pay you for not following terms. Red Stag terms state that you must make a qualifying deposit between no deposit bonuses to be allowed to process a withdraw. Intertops terms state that you must make a qualifying deposit between multiple free Bonuses to be able to process a withdraw. Be sure when you use a no deposit bonus code from Miami Club Casino as you know with WGS operated Online Casinos, you must make a qualifying deposit between Free Casino Bonuses. Miami Club is prohibited in Australia, Israel and United Kingdom locations. Be sure when you use a free Bonus code from Lincoln casino as you know with WGS powered casinos, you must make a deposit between free Casino promotions.